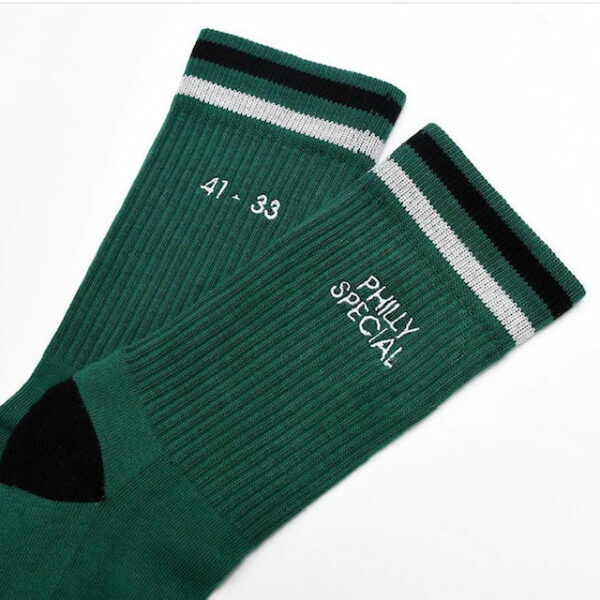 Philly Special Kennedys have asymmetrical embroidery in white on our new dark green body luxe athletic socks – one sock reads: “41-33” and the other sock “PHILLY SPECIAL”. Kennedy lux athletic sock made by local Philadelphia brand American Trench, were inspired by a photo of JFK on a yacht watching America’s cup. Knit in Pennsylvania from USA grown and spun Supima cotton. This crew length sock has both a vintage and a contemporary casual style that pairs well with boots, sneakers, mocs, or even wingtips. If you are stylish enough, you can rock them with wool trousers and derbies like JFK. Made in USA.